NEW YORK (CNNMoney.com) -- The government's list of troubled banks hit its highest level since 1993 during the second quarter, although the pace of growth continued to slow, according to a government report released Tuesday. The number of banks at risk of failing rose by 53 to 829, the Federal Deposit Insurance Corp. said in its quarterly survey of the nation's banking system. That increase marks the smallest rise since the first quarter of 2009. Click the chart to see more on the bank index. However, it's still nearly double the 416 banks that were on the FDIC's watch list a year ago and is up from 775 in the first quarter of this year. Banks that end up on the problem list are considered the most likely to fail. But few of the lenders on the list actually reach the point of failure. On average, just 13% of banks on the FDIC's problem list have been seized and shuttered by regulators. So far this year, 118 banks have failed, with 45 closings during the last quarter. While FDIC chief Sheila Bair said she expects 2010 bank failures to exceed last year's tally of 140, the total amount of assets from this year's failures will likely be lower since banks have been cleaning up their balance sheets. More money in the kitty. The FDIC reported a second consecutive increase in its deposit insurance fund, which covers customer deposits when a bank fails. The fund, which had been dwindling for two years, grew by $5.5 billion, but it still operates in the red, with a deficit of $15.2 billion. "As we expected, demand on cash have increased this year," said Bair. "But our projections indicate that our current resources are more than enough to resolve anticipated failures." Meanwhile, banks and other institutions insured by the FDIC collectively earned approximately $21.6 billion during the quarter. That's the highest in nearly three years and reversing last year's $4.4 billion loss. Two out of three banks reported higher profits compared to a year ago, as they set aside fewer funds to cover bad loans for the first time since 2006. Banks reduced their quarterly loan-loss provisions to $40.3 billion, according to the FDIC. That's down more than 40% from a year ago. Although bank earnings are still low by historical standards and the number of problem banks and bank failures remain high, Bair remained optimistic. "As long as economic conditions remain supportive, most institutions should maintain profitability and increase their capacity to lend." she said. The latest reading on the health of the industry provided a modest boost to bank stocks Tuesday. 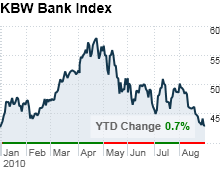 The KBW Bank Index (BKX) edged up 1.3% in late morning trading.